If you have access to wood then you can't beat the feel of a good fire. The wood burning fire I selected is here . I like to be able to see the fire. I'm using two wood fires. One in the basement mudroom and one in the living room. In practice the workhorse will be the mudroom fire because it is better to handle the messy wood there. The hot air from there will be ducted to the main level living area. The wood fire in the living room will likely only get used on special occasions such as Christmas and Thanksgiving and a few other long winter nights. Can either feed the heat exchanger with fresh air from the HRV or let it recirculate the air already in the room. Recirculation is my choice as it will make the room warmer. To avoid fan noise, put the fan remote in the basement ceiling. All EPA-certified stoves run within the same band of overall efficiency (combustion and heat transfer) - about 70 percent plus or minus 10 percent. Needs to be an "Advanced Combustion" wood fireplace, ie one that is a fire behind gasketed glass doors that does a secondary burn of the emitted gasses. The fire is fed with outside "burn" air and all fire exhaust goes out the chimney. Room air is blown in separately and then goes via a heat exchanger before being sent to the room as hot air. You can divert the hot air off to other parts of the house. You can place a heat pump in the warm output air and use it to make hot water. It must be 2.0 gr/hr or less to be sold and installed in WA state. Blaze King also said: "You should look for a non catalytic stove with an HHV efficiency rating of 65%-70%, any more efficient that in this range could result in poor performance. I might suggest you look for a very large firebox 3.5 cu. ft. or more.". If the fire is too efficient then the gasses in the chimney will be too cold by the time they get to the top of a 50 foot chimney. A cord is a volume of neatly stacked firewood measuring 128 cubic feet. The traditional way to stack a cord is to make the pile 8 feet long, 4 feet high, and 4 feet deep. If you are using 24-inch wood, such a cord is two stacks deep. If you are using 16-inch wood, such a cord is three stacks deep. My choice is to standardize on 18" long wood (to easily fit into a 21" firebox). This means if stacking in two rows then the length of the wood rack should be 12'8" long (with a height of 4'). There will be a fan to drive the room air through the heat exchanger. You need to ensure there is absolutely no fan noise. Put the fan remote in the basement. When selecting a fire don't forget about the cost of the chimney. The chimney will easily cost as much as the actual fire. 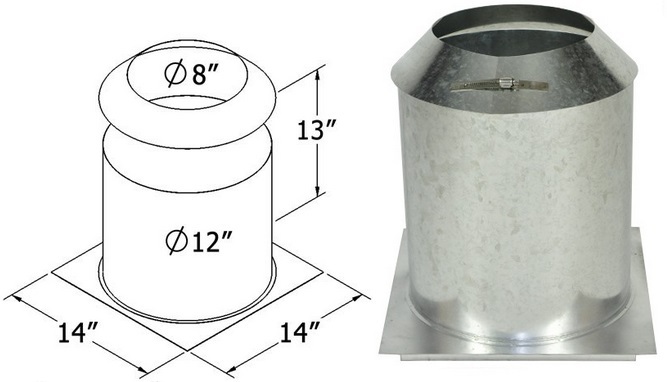 Small diameter chimneys are less expensive than large diameter. You must use a chimney with a spec that is as specified for the particular fire model you chose. It must be a stainless chimney for a wood burning fire. 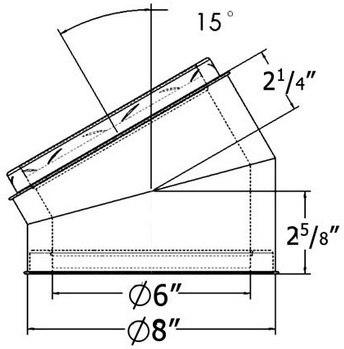 The chimney needs to be high above the roof in order to meet the 2 foot 10 foot 3 foot rule. It must be at least 2 feet taller than any structure within 10 feet of it and also at least 3 feet higher than the point at which it penetrates the roof. In my case I need to have a couple of joggles in the chimney to get it more than 10 feet from the edge of the cupola. My assumption is that the railings round the top of the roof do not count as being part of the roof height as they are permeable to wind, so that means the chimney only needs to be 2 foot higher than the top edge of the roof. In practice my chimney height is the same as the top of the railings. The chimney may require guy wires to strengthen it from high winds. Make sure the fire you chose is able to handle the long length of chimney that will be fitted to it. The chimney flue should be the same size as the appliance flue collar. Chimneys that are over-sized for the appliance they serve are common, partly because people used to think that bigger is better, but bigger is not better when it comes to chimney sizing. A given volume of flue gas flows faster and has less time to lose heat in a small chimney flue than in a large one. In planning wood heating systems, experienced installers will sometimes choose a chimney that has a smaller inside diameter than the appliance flue collar. This is usually done when the chimney runs inside the house and is very tall. Chimneys that exceed 8 m (about 25 ft.) in height sometimes produce more draft than the appliance needs, so a smaller chimney can be used without any reduction in performance. It is best to route the chimney inside the building enclosure as this avoids excessive cooling of the gasses in the chimney (reducing up-draft) and also inside it helps heat the house. My choice is to use the Shasta insulated 6" chimney system. The inside diameter is 6" and the outside diameter is 8". 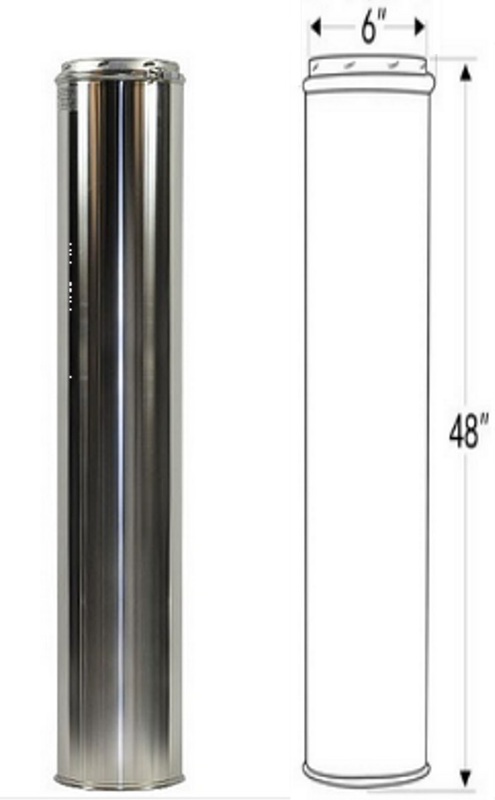 Shasta Vent All-Fuel HT Chimney is a double wall, solid-filled residential chimney featuring .020" type 304 Stainless Steel inner and outer walls with a 2" clearance to combustibles. 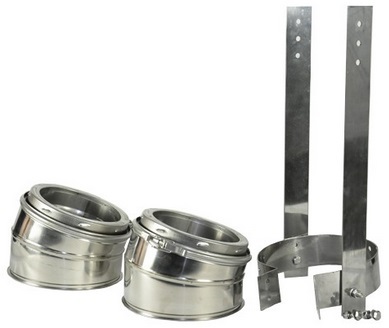 All-Fuel HT Chimney also features precision engineered twist-lock end rings and quick and easy Locking Bands. The high-temperature ceramic blanket insulation is encased between the stainless steel walls of the pipe sections to maintain a strong draft, while maintaining a relatively cooler temperature on the exterior wall. 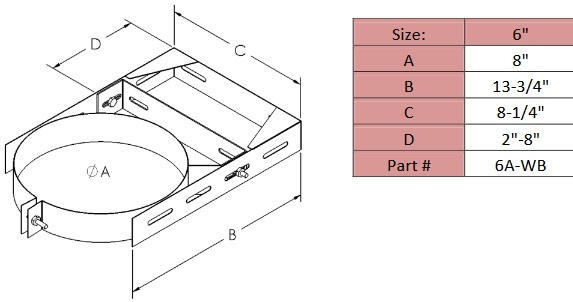 In installations where offsets are required up to four 30 (or 15) Degree elbows, each capable of rotating 360 Degrees, can be used in the system. 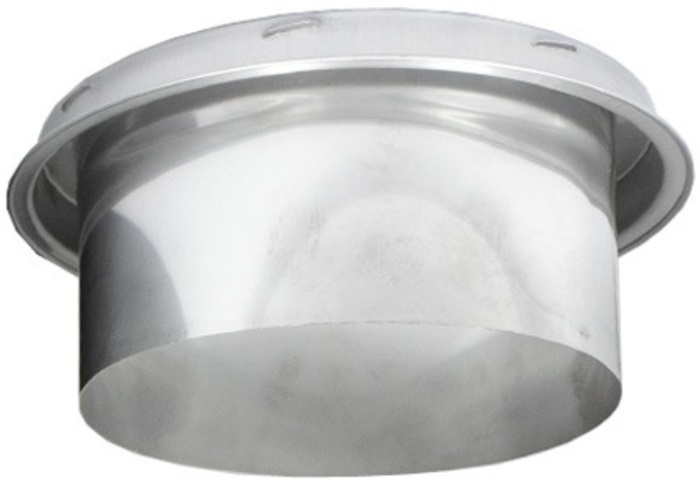 The Shasta Vent All-Fuel HT Chimney is ETL Listed by Intertek to the HT requirements of UL 103. Tested to 1000 Degrees F continuously, 1400 Degrees F for 1-hour, and 3x 2100 Degrees F for 10-minutes as would be encountered in a creosote fire. It is best to buy the fireplace before buying the chimney to ensure the fire can properly interface with the selected chimney system. You may well need to use a "Finishing Colar" to provide the interface. Note that it is only allowed to have two joggles. In my case a 15-15 joggle is used in the basement and a 30-30 joggle is used in the bedroom ceiling. The bracket will be installed under the wood framed box in the ceiling. Rather than use a framed ceiling support box with chimney connectors, in my case just use a regular 4 foot chimney section supported by the raw concrete of the floor. Concrete is not combustable and doing it like this avoids having to use an adjustable length chimney section and lengths other than 4' to get exactly the required length to the ceiling box. The concrete right up to the outer chimney wall also provides a fire stop between floors. It is necessary to cut away the flooring EPS in this area and frame the opening with lumber. The EPS cut away and wood framing needs to be before the concrete pour so the fire can be tested ahead of the concrete pour. Use a chimney support bracket. Only the 4" concrete topping layer will flow to the outer chimney wall. The "insulation shield" will be installed upsidedown with the square plate at the top. The wood will form a frame with a 12"x12" opening. The chimney goes through the collar with no need to use a particular chimney section length. Different from what's shown in the picture, the round ring will sit on top of the square plate and will stop the wet concrete falling through.